Director: William Wiard / Writer: Jennifer A. Miller / Cast: Donna Reed, Larry Wilcox, Diane Franklin, Ally Sheedy, David Ackroyd, Renée Jones, Bill Paxton, Vicki Kriegler, Nancy Cartwright, Deena Freeman, Sally Klein, Donald Hotton. Look. At. That. Cast. Bill Paxton! Ally Sheedy! Diane Franklin! Sissy from Jason Lives! The future voice of Bart Simpson! 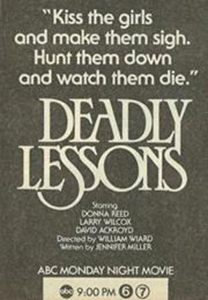 Deadly Lessons is the TV movie that just gives, gives, gives! These come from Stephanie (Franklin) to her cab driver as they approach the prestigious Starkwater Hall prep, where she’s joining the summer session early along with a small group of other girls who need to buck up their ideas. No sooner does Stephanie arrive, than one of bitchy girls is found drowned in the lake. Everyone says it’s an accident bar local detective Russ Kemper, who doesn’t take kindly to headmistress Miss Wade’s insistence that the school is not damaged by bad press. There’s not a spot of blood to be seen in all of Deadly Lessons, it really is as if we’re watching Jessica Fletcher’s youthful memoirs for all the red herrings, questionable performances, and absence of violence. All that was missing was that judgmental shake of the head thing she did after the killer freely admitted how and why they did it – although in this case, the mystery is not so easy to solve. Without a doubt, the primary appeal is in the cast, from Sheedy’s pre-Breakfast Club rich girl, to Nancy Cartwright’s (Bart!!) unwanted over-eater, though you wonder how many highlight it on their respective resumes. This could be shown on TV any Saturday afternoon and cause zero offense. An interesting one time affair, but not a class you’d want to repeat. No home video release (beyond a German one under the name High School Killer) has surfaced, hence the significant lack of artwork. Blurbs-of-interest: Paxton was also in Night Warning, Mortuary, and later Club Dread; Jones was perky camp counsellor Sissy in Friday the 13th Part VI: Jason Lives.